SAN JUAN, Puerto Rico -- Hurricane Maria's destruction has set Puerto Rico back decades, even as authorities worked to assess the extent of the damage, Puerto Rico's nonvoting representative in the U.S. Congress said Sunday. Engineers on Sunday planned to inspect the roughly 90-year-old Guajataca Dam, which holds back a reservoir covering about 2 square miles in northwest Puerto Rico. The government said it suffered a large crack after Maria dumped 15 inches of rain on the surrounding mountains and that it "will collapse at any minute." Nearby residents had been evacuated, but began returning to their homes Saturday after a spillway eased pressure on the dam. Puerto Rico's National Guard diverted an oil tanker that broke free and threatened to crash into the southeast coast, said Gov. Ricardo Rossello, and officials still had not had communication with nine of 78 municipalities. "This is a major disaster," he said. "We've had extensive damage. This is going to take some time." Hyde County, North Carolina, officials ordered all visitors on popular vacation destination Ocracoke Island to leave on Monday, "due to the threat of hurricane Maria." "Direct impacts from the storm include tropical storm force winds and storm surge of 2-4 feet along the Outer Banks," the Hyde County administration said in a statement released late Sunday evening. It said, due to the official state of emergency, all ferry reservations were cancelled and tolls waived, so people fleeing Ocracoke would have to line up to be evacuated on a first-come, first-served basis. "Wind speeds could cause the suspension of ferry services early Tuesday morning, potentially making Monday night the last runs available. Decisive action is necessary for Ocracoke visitors to ensure you arrive at your destination safely," the statement said. According to the National Hurricane Center, Maria was centered about 350 miles south-southeast of Cape Hatteras, N.C. as of 5 a.m. eastern, heading northeast at about 7 mph. The storm was still packing sustained winds of 80 mph as a Category 1 storm. The U.S. National Hurricane Center (NHC) released its Sunday evening advisory to report that Hurricane Maria slightly weakened into a Category 1 storm as the maximum sustained winds decreased to 90 mph as it moves north at 8 mph. NHC says that Maria's core will move well east of the southeast coast of the United States during the next day or so. Tropical storm and storm surge watches are in effect for a portion of the coast of North Carolina. As of 11 p.m. ET, Hurricane Maria is about 385 miles south-southeast of Cape Hatteras. NHC says Maria is a large hurricane and hurricane-force winds extend outward up to 60 miles from the center. The death toll from Maria in Puerto Rico was at least 10, including two police officers who drowned in floodwaters in the western town of Aguada. That number was expected to climb as officials from remote towns continued to check in with officials in San Juan. Authorities in the town of Vega Alta on the north coast said they had been unable to reach an entire neighborhood called Fatima, and were particularly worried about residents of a nursing home. Across the Caribbean, Maria had claimed at least 31 lives, including at least 15 on hard-hit Dominica. Mike Hyland, a spokesman for the American Public Power Association, which represents the Puerto Rican power agency, said Sunday that restoration is a long ways off. The organization is working with U.S. Energy Department crews as well as New York Power Authority workers sent down by Gov. Andrew Cuomo to fly over the island and assess damage. Crews hoped to get helicopters and drones in the air over the next two days to assess the damage, but Hyland said they need to be patient and let the military continue rescuing people before focusing on restoring power. "We are trying to get an understanding of the extent of the damage over the next 48 hours to then begin to work with our federal partners to get the right crews and equipment down to Puerto Rico," Hyland said. 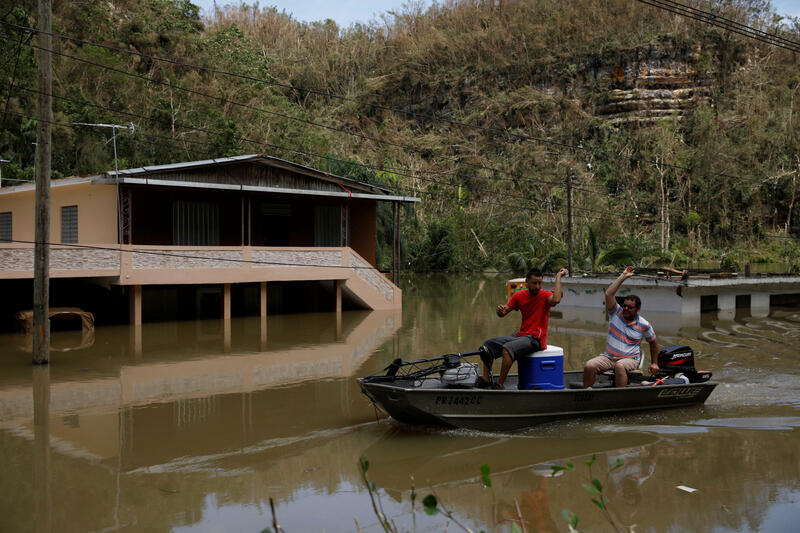 Large amounts of federal aid have begun moving into Puerto Rico, welcomed by local officials who praised the Trump administration's response but called for the emergency loosening of rules long blamed for condemning the U.S. territory to second-class status. The opening of the island's main port in the capital allowed 11 ships to bring in 1.6 million gallons of water, 23,000 cots, dozens of generators and food. Dozens more shipments are expected in upcoming days. The federal aid effort is racing to stem a growing humanitarian crisis in towns left without fresh water, fuel, electricity or phone service. Officials with the Federal Emergency Management Agency, which is in charge of the relief effort, said they would take satellite phones to all of Puerto Rico's towns and cities, more than half of which were cut off following Maria's devastating crossing of Puerto Rico on Wednesday. The island's infrastructure was in sorry shape long before Maria struck. A $73 billion debt crisis has left agencies like the state power company broke. As a result the power company abandoned most basic maintenance in recent years, leaving the island subject to regular blackouts. A federal control board overseeing Puerto Rico's finances authorized up to $1 billion in local funds to be used for hurricane response, but the governor said he would ask for more. "We're going to request waivers and other mechanisms so Puerto Rico can respond to this crisis," Rossello said. "Puerto Rico will practically collect no taxes in the next month." U.S. Rep. Nydia Velazquez of New York said she will request a one-year waiver from the Jones Act, a federal law blamed for driving up prices on Puerto Rico by requiring cargo shipments there to move only on U.S. vessels as a means of supporting the U.S. maritime industry. "We will use all our resources," Velazquez said. "We need to make Puerto Rico whole again. These are American citizens." A group of anxious mayors traveled to the capital to meet with Rossello to present a long list of items they urgently need. The north coastal town of Manati had run out of fuel and fresh water, Mayor Jose Sanchez Gonzalez said. "Hysteria is starting to spread. The hospital is about to collapse. It's at capacity," he said, crying. "We need someone to help us immediately." Across Puerto Rico, more than 15,000 people were in shelters, including some 2,000 rescued from the north coastal town of Toa Baja. Many Puerto Ricans planned to head to the mainland to temporarily escape the devastation.